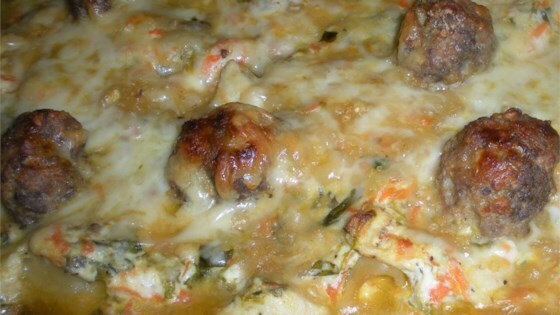 "Italian wedding soup combined with lasagna...weird concept I know, but very delicious!" Melt 1 tablespoon butter in a large pot; cook and stir 1/2 small onion and 1/2 garlic clove until onion is translucent, about 5 minutes. Stir shredded carrots and escarole into onion mixture; cook and stir until escarole is wilted, about 10 minutes. Pour chicken broth into pot with vegetables and bring to a boil. Reduce heat to low and simmer chicken breasts in broth until chicken is no longer pink inside, about 10 minutes. Remove chicken breasts and vegetables from broth with a slotted spoon, let chicken cool, and chop into bite-size pieces. Set chicken and vegetables aside; retain chicken broth in pot. Combine meat loaf mix, bread crumbs, egg, remaining 1/2 small onion, remaining 1/2 garlic clove, onion powder, garlic powder, salt, and black pepper in a bowl; mix thoroughly. Scoop about 1 1/2 teaspoon meat mixture and roll into a small meatball; repeat with remaining mixture. Refrigerate meatballs until firm, about 30 minutes. Bring chicken broth back to a boil, reduce heat to medium-low, and simmer meatballs in broth until no longer pink inside, about 10 minutes. Remove meatballs from chicken broth with a slotted spoon. Retain chicken broth in pot. Bring chicken broth back to a boil, reduce heat to medium-low, and cook lasagna noodles until cooked through but still slightly firm to the bite, about 10 minutes, stirring occasionally. Drain and set noodles aside. Reserve remaining chicken broth. Combine chopped chicken, vegetables, ricotta cheese, and parsley in a bowl; season with salt and black pepper. Chill mixture for 10 minutes to become firm. Preheat oven to 375 degrees F (190 degrees C). Coat the bottom of a large, deep baking dish with olive oil. Place 3 cooked lasagna noodles into baking dish. Layer 1/3 the ricotta-chicken mixture and 1/3 the meatballs over noodles; sprinkle layers with 1/3 cup Parmesan cheese and 2/3 cup mozzarella cheese. Repeat layers twice more, using 3 lasagna noodles, 1/3 the ricotta mixture, 1/3 the meatballs, 1/3 cup Parmesan cheese, and 2/3 cup mozzarella cheese per layer. Bring remaining chicken broth to a boil, reduce heat to low, and whisk cornstarch into chicken broth until thickened, about 5 minutes. Pour thickened chicken broth over casserole. Sprinkle remaining 1/3 cup Parmesan and 2/3 cup mozzarella cheese over top. Bake casserole in the preheated oven until bubbling and cheese topping has melted, about 20 minutes. A bit bland. Switch italian saugage for meat loaf mix. Also added a layer of chopped tomatoes.Keep crushed red peppers on the table for real heat lovers like me! Something different for dinner and everyone loved it. The combination of ingredients came together so well. We used spinach. Family said to save this recipe.